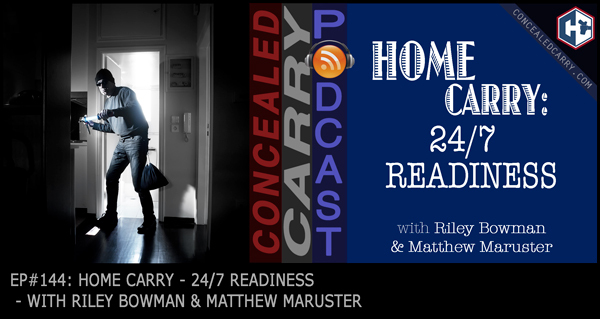 Riley and Matthew decided to address the issue of “home carry,” or making sure one carries all the time including at home…which is the one location that statistics show you are most likely to need access to your gun at a moment's notice. We talk about some of the strategies and tactics to keep in mind to make sure you are prepared 24/7! Press ‘PLAY' above to listen now! Loved the episode guys!! I just wish I could get more of my loved ones as serious about constant carry as we are. Thanks for all you do. Just a quick comment that has to do with home awareness. My 8 yr old son and I love running around the house with the classic nerf guns, and as you may know the more imaginative you can be with kids the funnier it is to them. So something I do is truly role play like I am finding the most defendable or best offensive positions I can during these heart racing escapades. Also we use a laser tag game which involves magazine reloads which really gives you a concept of just how quickly you can go thru all your ammo. The boy loves it and never knows that I’ve imagined him as a drug addict, thug, or raspist criminal on multiple occasions. Thanks for all the amazing content you put out. Yours truly. An amateur for life. I’ll always be learning. Calvin, thanks so much for the great feedback. I don’t know if you see it too, but I find that more and more people are becoming aware of the benefits of concealed carry and proper gun training. I think it is due to level headed people like yourself who can be a positive example of gun owners. One note about your loved ones, less enthusiastic outlook on carrying constantly. A while back I concluded that some people are just not wired to be the protector. It doesn’t make them bad or flawed, they just have a different drive that motivates them. As long as we can get them to a competent level that raises their awareness to the max they can function, I think it is not a lost cause. We can push, and be even convincing, but alas, their nature is not to be the protector warrior. The good thing is that there are people like you, who assume that role for the family. Look at it this way, you may be so good at the role of sheepdog, that inherently your family feels incredibly safe. 🙂 Not saying we let our loved ones walk around in dangerous ignorance, but I think you know what I am saying. The story about the nerf and laser tag wars with your son is awesome. Not only is this good for you, but it is undoubtedly ingraining some basic tactics into his brain and if he ever is to want to go into the shooting sports, will definitely benefit him. No different than playing catch with the ball helps them when they go into little league. Thanks again and sincerely appreciate the comments! Stay safe and God bless. Matthew, I wondered if you (or the guys) offer some suggestions for balancing readiness with having a night-cap. I have a ZERO-Tolerance policy about drinking while I carry. I know Riley and Jacob don’t drink, so it’s arguably a little easier to be armed at all times. Is a quick access safe the solution, so that I can disarm and have an adult beverage? AJ, great question and you are probably not alone in wondering about this. I have to admit, I hardly ever drink alcohol. Whether inside or outside my home, I find as I’ve gotten older, my ability to function as a member of society the next day is severely diminished lol I do love margaritas and if I was going to have a drink with dinner or something that would be the one. As far as your zero-tolerance policy dealing with firearms and alcohol, you are very wise. I know there are various levels of impairment that come from alcohol, and we all like to think we know where that occurs for each of us, but if we were able to accurately know where the line is, I wouldn’t have been able to arrest so many people for driving under the influence (because hardly any of them actually thought they were impaired). As far as the best solution, I would have to say that a quick access safe is a great option. Not all safes I would consider ‘quick access’ but the RFID, fingerprint, and keypad technology in the modern safes are very reliable and allow for super fast access. We all live our lives and should be able to do the things we like to do (especially within our own home) provided we do not endanger others. Sometimes this involves things that may cause us to become impaired, like drinking alcohol. As long as we understand the limitations that our actions may cause us in the ability to defend ourselves or others in our home, I say go for it. Even though I almost never drink alcohol, I have had several surgeries on my knee. I was stabbed deep into the joint, which resulted in a septic knee that deteriorated my joint. Years later I completely tore the ACL which required another surgery. Since those two surgeries, I have had two more to repair a torn meniscus in the same knee. Each time I was prescribed Vicodin and I have chronic pain that had the doctors providing Vicodin as a pain management strategy. Among other concerns, I hated the way the Vicodin made me feel, even when I took only the prescribed amount. Even when I am in tremendous pain in the evenings, I refuse to take anything that would alter my perception or ability to act. That is just my decision. If I had major surgery on my knee again (which is only a matter of time) I am sure that I would be sent home with a pain killer. I may have to choose to take Vicodin following the surgery even though I don’t necessarily want to. If that were to occur, I would definitely follow along like you and use a quick access safe, not carry and realize that if something were to happen where I needed to defend my family, I would not be as able to. Thinking about these things is such a responsible thing and I commend you for bringing it up because it is something that I know we may have had a blind spot to because none of us typically drink alcohol. Sorry for the long winded response, I just wanted to make sure I didn’t leave you feeling like you were alone in wondering about these issues, and I wanted to share another aspect of the intoxicated gun fighter scenario that I have personally dealt with. Sounds like you are a super responsible and educated gun owner. Thank you so much for listening and for the question! God bless and stay safe!